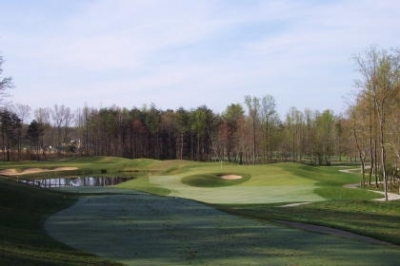 BELTSVILLE, MD -- "We're always striving to create different looks with our work," remarked Tom Clark (of Ault, Clark & Associates), when asked about his firm's goals for the golf courses they design. "And Cross Creek presented a genuine opportunity to do that. There are certainly many distinctive looking golf courses in the DC area, but that's the only one I can think of that truly reminds me of a place you'd probably never associate with the Mid-Atlantic -- northern Colorado." DC Suburb, or Rocky Mountain High? You decide. 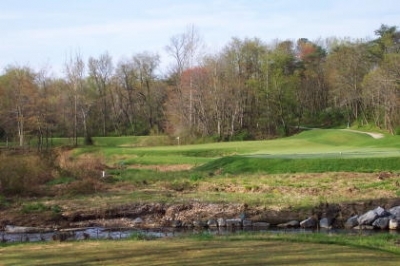 It's true -- and I think most golfers in the region would hardly conjure up images of the Rocky Mountain State when savoring the links of the Mid-Atlantic, but those impressions may change when they journey to Cross Creek Golf Club, located just off of I-95 in Beltsville, Maryland (about halfway between Washington and Baltimore). 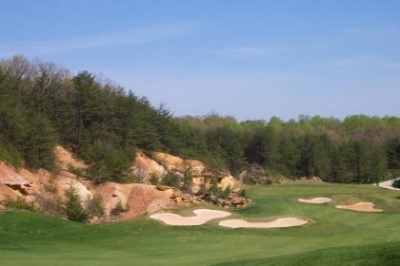 Cross Creek's 'high country' looks stems from a couple of its holes being located in an old quarry area, with multi-layer rock formations (or at least darn good impressions of them) bordering a reachable par five and a brutishly difficult par four. But don't get the wrong idea -- Cross Creek is not all John Denver's lyrical imagery and sandstone cliffs. In fact, the rest of the course is very much vintage Maryland. Clark elaborates: "When I say Cross Creek reminds me of Colorado, I'm only talking about those two holes, thirteen and fourteen. They kind of look like an old mining area out west -- there're these little scrub pines and exposed material that's not really like dirt -- it's calcified gravel and sand. 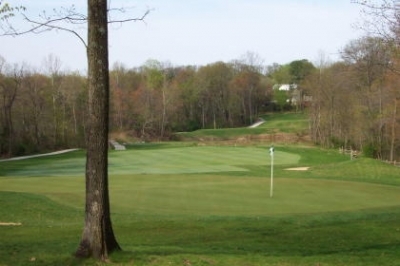 But the balance of the course presents a lot of the best of what Maryland's topography presents -- elevation changes, lush greenery and parkland style golf." As you'd expect from an Ault, Clark & Associates layout, there's excellent variety throughout. And while Clark says he would've preferred that the course have a bit more room in its corridors, he says when you look at the holes individually, you'll like what you see: "Cross Creek is a golf course with a lot of different possibilities -- it's got some great individual holes. It's just like you've got to go from one to the next to really appreciate it -- and if it gets a little more width in the years to come, it'll take its place as one of the area's better public courses." 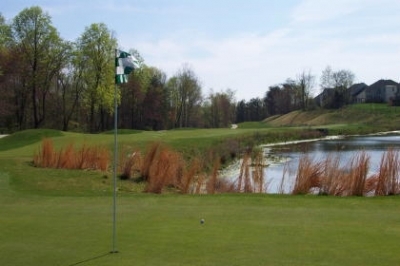 The 341 yard, par four 8th hole is one of several excellent short par fours at Cross Creek Golf Club. Not that it doesn't fit in that category already -- but as alluded to above, you'll need your straight ball to navigate safely on a good many of the holes. While most of the newer upscale public layouts are horizon-to-horizon wide, Cross Creek takes the opposite tack, and may even give you a dose of tunnel vision (once or twice) along the way. The tight nature is accounted for in another way, however -- yardage. It's not like you'll have to pull driver on every hole and bang it out there 280 yards, straight as Interstate 40 through the Texas panhandle. The course is 'only' 6356 yards from the back tees (par 70), and the longest hole is just 517 yards in length. All three of the par fives are arguably reachable in two, even for medium length hitters (again, assuming pinpoint accuracy), and only one par four probably rates above 4.5 on the scorecard. The par threes are scenic and fair. The greens are decent in size for this type of layout, and the mild undulations and reasonable speeds ensure that putting is fair and straightforward. The last thing a horizontally challenged course needs is tricked-up greens, and we're happy to say that that's far from the case at Cross Creek. They're also in very good condition for a recently opened facility. Clark didn't make it easy for you on the par four 11th hole (436 yards). Par on this hole feels like a birdie. The layout as a whole (built, owned and operated by Landscapes Unlimited, of Lincoln, Nebraska) is a treat for the eye. Even the houses, which line a portion of the links, are well shaded in most instances. A ball-strikers track for sure, but easily enjoyable for everyone. 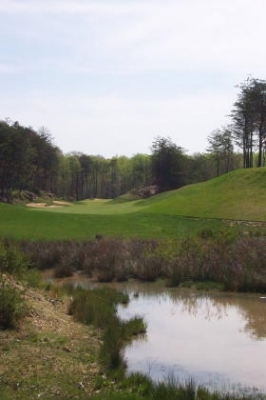 Mark Conn, Cross Creek's Director of Golf, shares his impressions: "If you look at the widths of the fairways, you'll see the course really isn't that narrow. We're a bit squeezed in the rough areas -- there isn't a whole lot of rough between the fairways and the edge of the trees or the wetlands. So we'll offer the same fairway playability of almost any course, but you'll also need to avoid the big misses. We're not allowed (from a county permitting standpoint) to do a whole lot of clearing right now, and there are quite a few reforestation areas out there." Conn was also quick to point to the bigger (if not 'wider') picture: "Considering we're in the midst of a pretty heavily populated area, folks are always surprised at how 'natural' it is out here. We're constantly seeing wildlife around the course, and there're wetlands, a stream, different types of trees, and rock outcroppings -- it gives the property a get-back-to-nature feel." More Colorado scenery on the incredibly tough par four 14th hole. Don't forget the other 'intangibles' in Cross Creek's favor. Conn casually reminds us of what's already here, and what's to come: "We like to use the slogan 'The Best Drive off of I-95,' because we want to emphasize how conveniently located we are to both Washington and Baltimore metropolitan areas -- about a half hour from the downtown business districts of both cities. We're also concentrating on providing good value for the fees you'll pay. 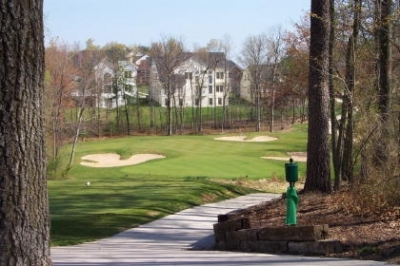 Our clubhouse will be done in early summer, and we'll also put in two tennis courts, a swimming pool and a pool house. It'll be a great, great facility for the price, and that's our target." Looking towards the future, Cross Creek's success will help ease the recollections of difficulties encountered during construction. Clark says there were many: "A large contributor to the tightness of the course is the fact that the quota of trees that we could take out was tied to the housing development -- so we couldn't remove nearly as many as we would've hoped for. Then, there were several considerable delays in obtaining permits to build, so the course ended up being built, kind of in stages. The project took considerably longer than we would've wanted, but in the end, it's all working out." Conn said in addition to the practical problems, there were some jurisdictional issues to solve: "Our facility is probably one of the few that can actually claim to reside in two different counties. Three of our holes are in Montgomery County, and the others are in Prince Georges County -- so we had to figure out the different requirements for permits from each. And we also had to determine taxes, and the like. It was an interesting process, that's for sure." The 187 yard, par three 7th hole looks difficult... and it is. Cross Creek opened last August, and for a new course, it's in surprisingly good condition (in most spots). Conn says they'll continue to nurse it along, with the course's long-term health in mind: "A lot of our customers have come in expecting the greens to be real fast. But with last summer's drought and the cold winter, we'll pursue a moderate schedule for cutting 'em down, because we'd rather have stronger turf that takes a while to mature, rather than risk losing it for years." That's smart thinking in the highly competitive Washington upscale golf market. Some area courses really took the brunt of last summer's hot, dry conditions, and will certainly take valuable time to recover. Cross Creek's getting it right from the start. Turning to the layout, highlights include number three, a 431 yard par four that plays downhill with a slight dogleg left. Tee shots will kick to the right, so it's best to aim a bit to the left to leave a short to mid-iron approach shot. There's a pond to the right of the green, but a large bunker protects you from the wet stuff should you miss by a bit in that direction. It's downhill to the 210 yard, par three 5th hole. But you'd better send it high and land it soft to make a score here. Five is an aesthetically pleasing par three, named 'Distinction' in the yardage book. 210 yards from the back and downhill, water guards the left side, waiting to swallow any ball hooked too much. A deep bunker protects short, so length and accuracy of your iron game is definitely tested here. Seven is the front nine's third par three, and it features another sizeable carry from the back tees -- 187 yards. There's a peninsula green that juts into a pond on the left side, and if the pin's located there (as it was on the day we played), it'll take quite a great shot to leave a birdie try. The back nine continues the accuracy challenge, leading to the 'Colorado' holes, thirteen and fourteen. Thirteen measures 515 yards, and the tee shot's slightly uphill to a plateau fairway -- and if it's really long, possibly down a gentle slope on the other side. Once you're on top of the plateau, you can see the multi-colored soil formations to the left, and you'll be a believer that you're somewhere else. Luckily, you probably won't be in the woods on the par three 12th hole. But there are some pleasant views from the trees, nonetheless. Conn describes the next hole: "Fourteen's got to be one of the toughest par fours in the state, and I'd almost put money on it. If you go too far to the right side of the fairway off the tee, you might be locked in (by a mound). It's a fair hole, but it's a very difficult tee and approach shot, too." Fifteen is the last of the quarry holes, but you've left Colorado behind when you exit the fourteenth green. 206 yards in length, it's a full carry over an environmental area -- and it looks much longer. Three nice par fours close out the round. Eighteen finishes up right in front of where the new clubhouse is being finished, and promises to be a nice conclusion to many a pleasant golf round at Cross Creek -- for now and in the future. So next time you need to get away from the Mid-Atlantic for a brief spell, try visiting Colorado -- and head to Cross Creek Golf Club. Fri-Sun & Holidays: $67, includes cart. Mon-Thurs Twilight (after 2:00 p.m.): $40; Weekends & Holidays Twilight: $45. Range balls -- $6. Walking is unrestricted, but it's the same fee.